Buy eBook Now Houses of the Welsh Countryside: A study in historical geography (Second Edition) at Google Play. When this book was first published in 1975 it was at once enthusiastically received by scholars and the general public alike and recognized as a classic of its genre. It represented a notable publication of the early fruits of the Commission’s work on the side of its responsibility for the National Monuments Record for Wales. During the years which have since intervened, much fresh information has come to light concerning Welsh houses – not least because of the intense interest awakened by the original publication. This new knowledge has, as far as possible, been incorporated in the new and revised edition, which contains approximately onequarter more material than the first. Although it has not been possible to alter the original text, a number of additional maps and photographs have been included and a new dust-jacket has been designed. The Commissioners would wish warmly to congratulate their Secretary, Mr. Peter Smith, those of his colleagues who were associated with him, and H.M.S.O. on the excellence of this volume. It marks another outstanding landmark in the study of vernacular architecture, not only in Wales but also in the British Isles, and a major achievement on the part of its author. 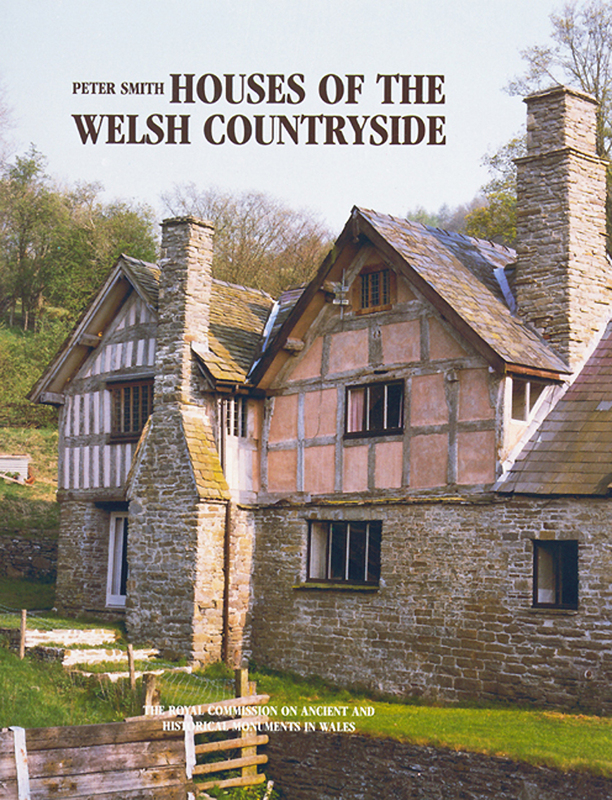 Although this second edition of Houses of the Welsh Countryside retains in their entirety the text, the illustrations, and the layout of the volume first published in 1975, it also includes a substantial amount of new information which has come to light since that date. Some of this new material takes the form of additional figures inserted where appropriate into the existing illustrative pages. Similarly a small number of additional colour plates showing typical houses in characteristic settings has been tipped into the text. There are also additions to the original map lists. It has not been possible for reasons of cost to bring the maps themselves up to date, but as the newly-discovered sites nearly always reinforce the distribution patterns first indicated, this omission is not crucial. The numbers of new discoveries can vary from a mere handful on one list to several hundred on another. All other new material is introduced as part of an additional SECTION IV at the back of the volume. Covering sites which were inadequately or incorrectly described in the first volume, involving in one case a complete reappraisal of the original reference. Describing and illustrating a small number of newly surveyed houses of especial interest which could not easily be fitted into the illustrations in the main text. Analysing the incidence of date-inscriptions as evidence for building activity. Listing and mapping a number of features of domestic architecture not previously so noted. Listing and mapping various features of ecclesiastical architecture which also occur in houses and which therefore have a bearing on the evolution of domestic architecture.